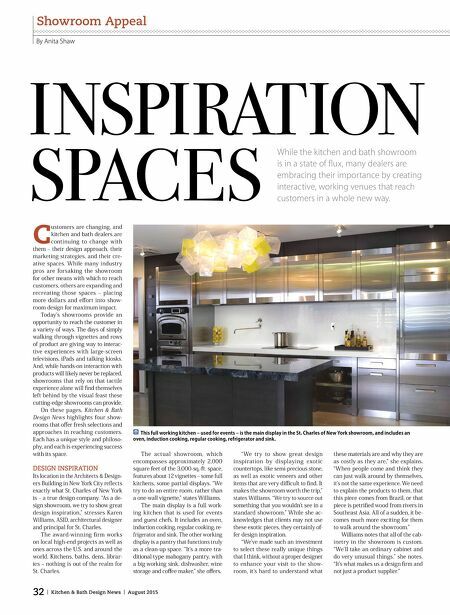 32 | Kitchen & Bath Design News | August 2015 Showroom Appeal By Anita Shaw C ustomers are changing, and kitchen and bath dealers are continuing to change with them – their design approach, their marketing strategies, and their cre- ative spaces. While many industry pros are forsaking the showroom for other means with which to reach customers, others are expanding and recreating those spaces – placing more dollars and efort into show- room design for maximum impact. Today's showrooms provide an opportunity to reach the customer in a variety of ways. The days of simply walking through vignettes and rows of product are giving way to interac- tive experiences with large-screen televisions, iPads and talking kiosks. And, while hands-on interaction with products will likely never be replaced, showrooms that rely on that tactile experience alone will fnd themselves left behind by the visual feast these cutting-edge showrooms can provide. On these pages, Kitchen & Bath Design News highlights four show- rooms that ofer fresh selections and approaches in reaching customers. Each has a unique style and philoso- phy, and each is experiencing success with its space. DESIGN INSPIRATION Its location in the Architects & Design- ers Building in New York City refects exactly what St. Charles of New York is – a true design company. "As a de- sign showroom, we try to show great design inspiration," stresses Karen Williams, ASID, architectural designer and principal for St. Charles. The award-winning frm works on local high-end projects as well as ones across the U.S. and around the world. Kitchens, baths, dens, librar- ies – nothing is out of the realm for St. Charles. The actual showroom, which encompasses approximately 2,000 square feet of the 3,000-sq.-ft. space, features about 12 vignettes – some full kitchens, some partial displays. "We try to do an entire room, rather than a one-wall vignette," states Williams. The main display is a full work- ing kitchen that is used for events and guest chefs. It includes an oven, induction cooking, regular cooking, re- frigerator and sink. The other working di splay is a pantry that functions truly as a clean-up space. "It's a more tra- ditional-type mahogany pantry, with a big working sink, dishwasher, wine storage and cofee maker," she ofers. 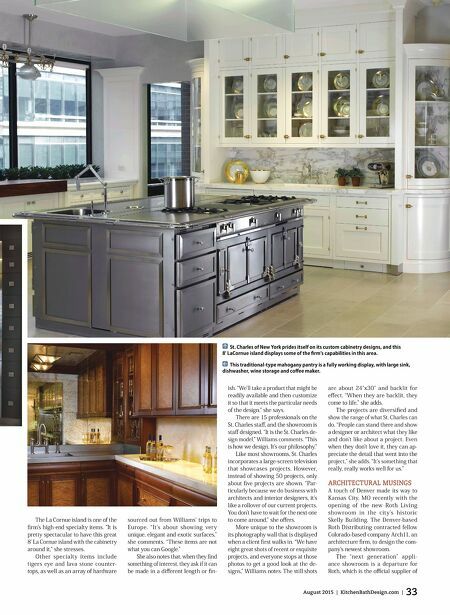 "We try to show great design inspiration by displaying exotic countertops, like semi-precious stone, as well as exotic veneers and other items that are very difcult to fnd. It makes the showroom worth the trip," states Williams. "We try to source out something that you wouldn't see in a standard showroom." While she ac- knowledges that clients may not use these exotic pieces, they certainly of- fer design inspiration. "We've made such an investment to select these really unique things that I think, without a proper designer to enhance your visit to the show- room, it's hard to understand what these materials are and why they are as costly as they are," she explains. "When people come and think they can just walk around by themselves, it's not the same experience. We need to explain the products to them, that this piece comes from Brazil, or that piece is petrifed wood from rivers in Southeast Asia. All of a sudden, it be- comes much more exciting for them to walk around the showroom." Williams notes that all of the cab- inetry in the showroom is custom. "We'll take an ordinary cabinet and do very unusual things," she notes. "It's what makes us a design frm and not just a product supplier." While the kitchen and bath showroom is in a state of fux, many dealers are embracing their importance by creating interactive, working venues that reach customers in a whole new way. This full working kitchen – used for events – is the main display in the St. Charles of New York showroom, and includes an oven, induction cooking, regular cooking, refrigerator and sink.